Alpine meets on Saturdays at the Anzac Rifle Range, Malabar. Sessions are listed below. All shooters in the morning session must be on the range by 9.25AM sharp. For the various afternoon sessions, shooters must be on range by the stipulated time. There’s a barbecue lunch after the morning shoot. Regular shotgun shoots are held on Friday evenings at SISC, Cecil Park. Check Our weekly ⇒NEWSLETTER⇐ (with the latest Club news, event details and updates) posted every Friday. 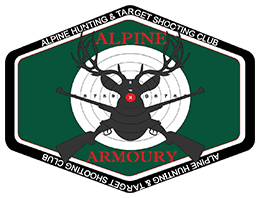 Whether you’re new to shooting or a licensed shooter, to take part in any Alpine shooting session you need to be a member of the Club. There are three categories of membership: Temporary Member, Associate Member, and Full Member. For details, fees and payment options, visit the Alpine Armoury website. Alpine’s pistol club holds matches at Anzac’s Horseshoe Range every Saturday afternoon. (Note:These are Alpine/NSWSA practical and service matches. Do not expect any other club or peak body to automatically recognise an Alpine pistol qualification.) There are two types of match: action pistol(moving through a course with multiple targets at different ranges) and service pistol (firing at a single target from 25m, 15m and 10m. For details see the Pistol page. All match participants must be thoroughly familiar with our Pistol Rules.